Would it be possible for you to upload a video demonstrating the issue please? I'm not quite sure I fully understand. Are you referring the preview of the nozzle that disappears when the mouse is left idle? 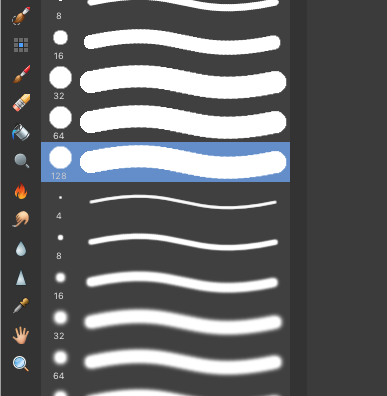 No, the highlighted brush in the brush panel. When you select a brush it's highlighted. If you resize the brush the highlight disappears. Making it difficult to visually know which brush you have chosen. Repeated from above... "I think ideally it should be sticky and just remain highlighted until you pick a different brush, even if you use a different tool then go back to the brush tool. That way you can visually see what the last brush was you were using. Would be a great help in the painting process when you have a ton of brushes in your brush panel that have similar thumbnails..."
If the size is stored as part of the brush (which appears to be the case) then when you change the size are you not in effect switching to a modified version of the brush which does not match the one that was previously highlighted in the panel? That's not the expected behaviour and nothing I've experienced in other software. It may be technically correct on some level but to someone using a certain brush for digital painting, resizing is just something you do, a lot, and your brush selection highlight in the panel shouldn't disappear. I believe it's breaking convention, whether intentional or not. Looks like a selection list lose focus bug for the pixel brushes then (for the list item) as far as the size is altered.